The spectacular colors of the midnight sun illuminated icebergs in the Ilulissat Icefjord, Greenland. Greenland is, quite literally, on the edge of the world. Of course, if you’re a local Inuit, then this massive island is very much at the centre of your own world. I spent around a week in Greenland, most of it in the tourist town of Ilulissat on the West coast. Situated by the shores of the magnificent Ilulissat Icefjord, it’s a great place to base yourself for hikes and voyages on the spectacular waters around Ilulissat. My visit in late July coincided with the Summer Equinox, the longest day of the year in that part of Greenland. I made this photo on a midnight cruise on the Ilulissat Icefjord. It’s a breathtakingly beautiful environment where some of the icebergs appeared to be the size of skyscrapers, albeit turned on their side, with others down to the size of a small car. Either way there were icebergs wherever I looked. 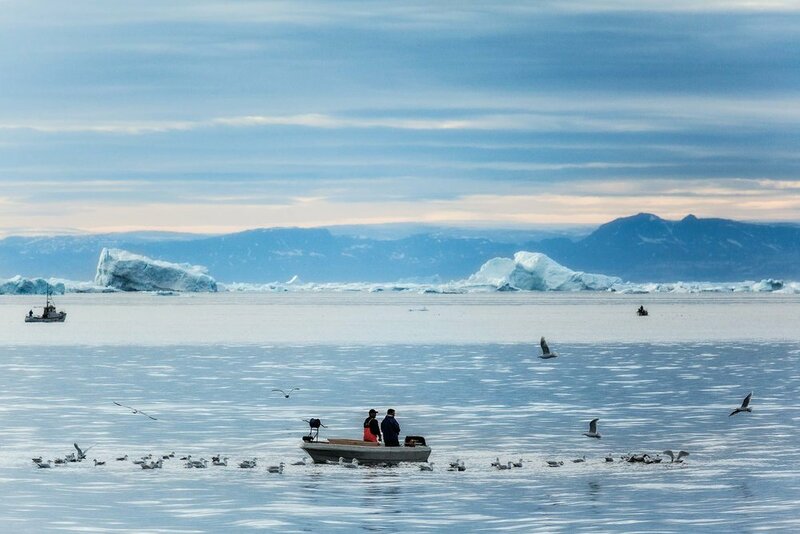 Local fisherman on the Ilulissat Icefjord near the town of Ilulissat in Western Greenland. Interesting subject matter is one thing, but the color of light under the midnight sun is what brought my photos to life. It was a surreal experience to witness such glorious scenes. To have the opportunity to photograph and share them with you here makes it all the more worthwhile. There are a few important factors to consider when photographing from a moving platform like a boat, car, train or plane. Let's consider the most fundamental concerns. If sharpness is key to the success of your image then it's essential to ensure you have a Shutter Speed that’s fast enough to cope with your own movement as the boat you're on passes through the landscape. I made the above photo at the top of this post at 1/200 second @ f/6.3 from the deck of a relatively fast moving fishing boat. I remember thinking at the time how I wished our friendly captain would slow down a bit. While I was working under the midnight sun, it’s not actually all that bright. I had to increase the sensitivity of my camera to ISO 800 to ensure I achieved the 1/200 second Shutter Speed. That may not seem all that high an ISO, but the photo was made back in 2011 with a Canon 5D Mark II camera. Previous experience photographing with that camera told me that moving above ISO 800 was not desirable due to a fairly substantial increase in noise and contrast. This is far less an issue with newer DSLR and mirrorless cameras. Sailing over the pristine waters of the Ilulissat Icefjord in Greenland. The other problem associated with photographing from a moving platform is the difficultly in achieving optimal composition. I found I needed to see the composition in my minds eye and then release my camera’s shutter, prior to the optimal moment, so that the exposure was made at precisely the right time and from the right place. Remember I was photographing from the deck of a fishing boat as it moved through the Ilulissat Icefjord. It can, on occasions, be helpful to keep both eyes open when working in this way. That particular technique can help you keep track of what's about to come into the frame, prior to you actually seeing it in your camera's viewfinder. I set my camera to Continuous Shooting mode, just like a sports or wildlife photographer would, enabling me to increase my chance of success by making a series of exposures as I past by each scene. It was then simply a matter of deleting the less successful photos, both in relation to sharpness and composition, so as to arrive at the photo that best depicted the scene in question. If ever you get the chance to visit Greenland, in the height of summer, I’d recommend it. It’s an amazing place where the wild is literally right outside your hotel window.